d. Dec. 13, 1944, Neuilly-sur-Seine, Fr. Russian IN FULL VASILY VASILYEVICH KANDINSKY, Russian-born artist, one of the first creators of pure abstraction in modern painting. 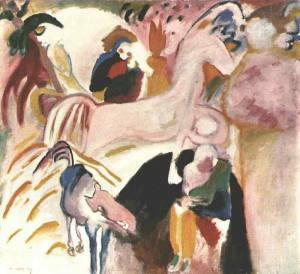 After successful avant-garde exhibitions, he founded the influential Munich group Der Blaue Reiter ("The Blue Rider"; 1911-14) and began completely abstract painting. His forms evolved from fluid and organic to geometric and, finally, to pictographic (e.g., "Tempered Élan," 1944). Eine sehr umfangreiche Linksammlung zu den Online-Werken von Wassily Kandinsky in Museen, Gallerien, Bildarchiven und anderen Websites. Kandinsky, himself an accomplished musician, once said ``Color is the keyboard, the eyes are the harmonies, the soul is the piano with many strings. The artist is the hand that plays, touching one key or another, to cause vibrations in the soul.'' The concept that color and musical harmony are linked has a long history, intriguing scientists such as Sir Isaac Newton. Kandinsky used color in a highly theoretical way associating tone with timbre (the sound's character), hue with pitch, and saturation with the volume of sound. He even claimed that when he saw color he heard music. Kandinsky's synaesthetic experience of 'the colour of music', and his exploration of pictorial harmony and discord, may be as important as 'the spiritual' in the story of his pioneering abstractionism. 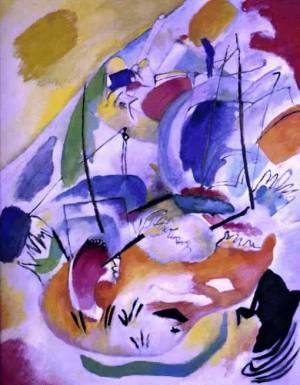 66 Masterpieces of Wassily Kandinsky. "That which belongs to the spirit of the future can only be realized in feeling, and to this feeling the talent of the artist is the only road. Theory is the lamp which sheds light on the petrified ideas of yesterday and of the more distant past." 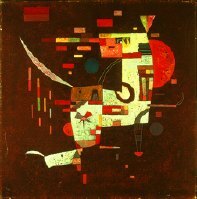 Wassily Kandinsky was a Russian born artist. A painter who lived through the Russian Revolution and World War's One and Two. 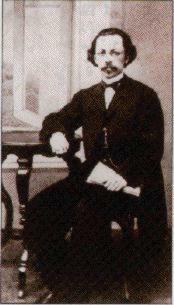 He was born in 1866 and died in Paris during 1944. As a young artist Kandinsky lived, wrote and painted in Munich, Germany. 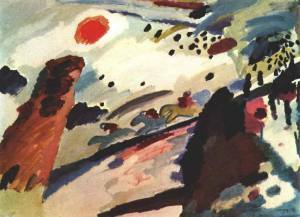 There has been a great deal written about Wassily Kandinsky because of the timeless nature of his being. He was a meticulous thinker, teacher and painter who's work will remain alive. 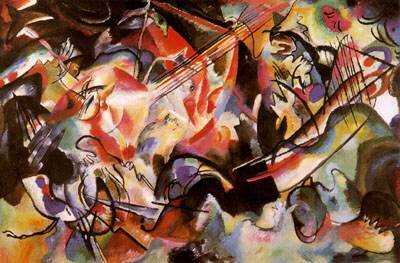 Vassily Kandinsky (1866-1944) stands as one of the dominant figures of twentieth century art. A pioneer of abstract painting, who systematically attempted to convey emotion and feeling outside of direct representation, he was hailed by the leading Surrealist André Breton as having led (with Picasso) the insurrection against imitation in art. Alongside his better known oils, Kandinsky produced watercolours, gouaches and prints throughout his life. It is this body of work that has been assembled at the Royal Academy and it offers a chance to view Kandinsky's artistic development over the course of his life. Dieser Beitrag thematisiert Kandinskys Ringen mit der `Schwelle´ in der Malerei. An Beispielen wie “Murnau mit Kirche”, “Kleine Freuden”, “Romantische Landschaft”, “Komposition V” u. a. wird versucht, Bezüge zur inneren Welt Kandinskys und zur Biographieentwicklung herzustellen. Wo bleibt das Geistige in der Kunst? In Anlehnung an Kandinskys "Über das Geistige in der Kunst" wird das Spannungsverhältnis zwischen Kunst als Selbstzweck (l‘art pour l’art) und Kunst als Lichtbringer (l’art pour l’âme) diskutiert. Sinneswelt und Seelenwelt bilden die zwei Quellen künstlerischen Schaffens. Anhand der Bilder 'Komposition 7' und 'Inneres Kochen' von Kandinsky und 'Blumenmythos' von Paul Klee u. a. werden diese Wege veranschaulicht. Synesthesia: Do you see what they see? Synesthesia--from the Greek syn, for together, and aisthesis, to perceive--generated a wave of scientific and popular interest around the turn of the twentieth century. Russian composer Alexander Scriabin, himself a synesthete, featured an organ that produced multihued light beams in his symphony Prometheus, the Poem of Fire. To many fin de siecle Romantics, synesthetes appeared to be humanity's spiritual vanguard, closer to God than the sense-segregated masses. "Such highly sensitive people," wrote Wassily Kandinsky, the Russian abstract artist, "are like good, much-played violins, which vibrate in all their parts and fibers at every touch of the bow."